The latest software being developed by MIT Computer Science and Artificial Intelligence Lab aims to be the “Photoshop for 3D materials” by making the entire 3D printing process more accessible to the public. Foundry includes real-time previewing, so as a user is tweaking their design, they’ll see exactly what it’s going to look like in terms of output, including the ability to drill down to a cross section to see how the 3D printer will produce the internal sections of the parts and the whole. Using the new MIT software, researchers printed a ping-pong paddle, skis with very shiny surfaces, the wheel for a tricycle, a bike helmet and a bone, which the team says could actually be used in surgical planning applications. The key is that each of these projects combined a number of different materials to achieve different functional properties in different parts of the whole. How easy is Foundry to use? The Photoshop comparison seems apt – the MIT team behind it tested it out with non-designers, providing three different objects for them to make, including a there and wheel combo, a teddy bear and the bone structure. Users managed to create them after an hour tutorial in an average of 48, 26 and 56 minutes respectively after getting the 60-minute walkthrough. 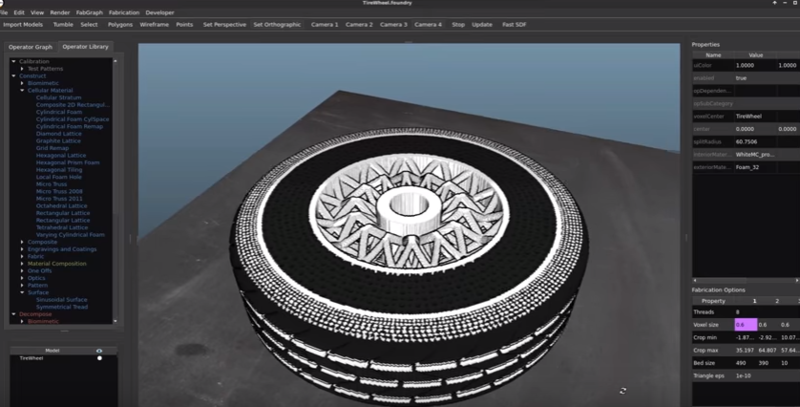 Already, the team says its testing has resulted in a better tricycle wheel design, and the potential for similar advancements in a number of fields exists should Foundry become an industry standard. 3D printing still hasn’t replaced traditional manufacturing methods at scale, but Foundry starts to make that seem more possible on a nearer time frame.